Greetings from North Queensland! I now understand why a lot of Aussies head north during the winter! I am currently sitting in my sister’s lounge room in shorts and t-shirt with the ceiling fan on…and it is winter! It is such a nice change from cold land down south! Anyway, yesterday my Mum, sister and I had our little craft stall at the Craft Spectacular and it was such a fun day! Lots of people through the door and lots of sales which is always exciting! In addition to selling my cards, I also made a whole heap of little girls hair clips out of grosgrain ribbon and felt…so when I get home I’ll take some decent pictures and share them with you all. 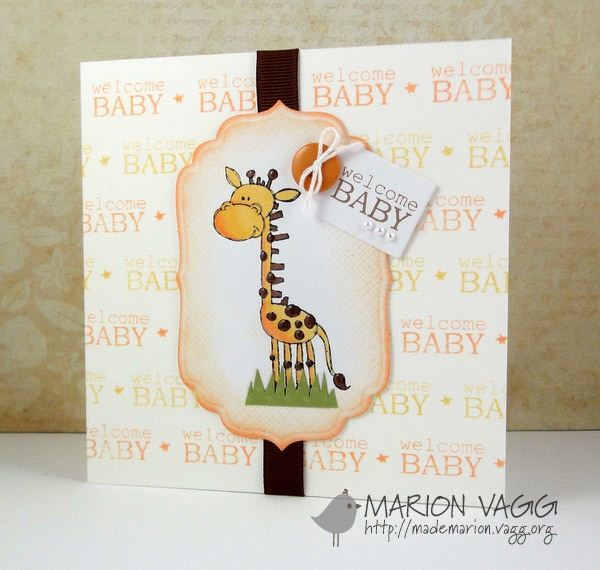 But onto a baby card that I made recently which was one of my sales yesterday. I used the ‘Welcome Baby’ sentiment out of Jane’s Doodles ‘Noah’s Ark’ stamp set and stamped it repeatedly in distress inks to make the background. The giraffe is a Recollections stamp and coloured in with copic markers.